It’s CandyGrams time again! You can send a fun, sweet treat to your favourite people while also supporting a very worthy local cause. CandyGrams are a fun gift idea for anyone you care about from your grandma to your hubby, to your best friend or teacher. They are only $10 and include a Fuzzy Heart Carlton Card, a personalized message of your choice, 2 delicious Purdy’s Chocolates, postage, and exciting gifts. A Loving Spoonful is a volunteer-driven, non-partisan society that provides free, nutritious meals to people living with HIV/AIDS in Greater Vancouver. Every year, they sell CandyGrams to raise funds for meal programs that feed and offers services to approximately 100,000 individuals and families who suffer from HIV from the Lower Mainland. They are only 20% government funded so 80% of their donations and support are dependent directly from our fundraising efforts. Every Candy Gram sold gives 2 or more meals to someone in need. 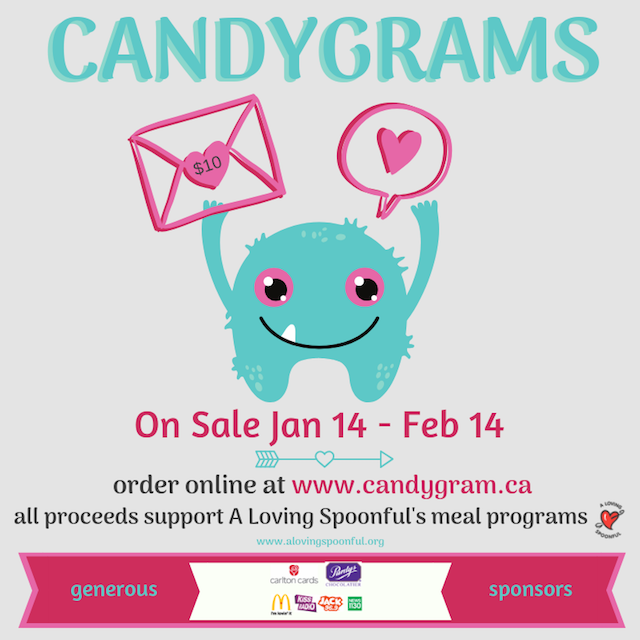 Follow A Loving Spoonful on Facebook and Twitter (tag: #candygram) for more information.